On March 21 Ascension’s Council emerged from Executive Session having discussed Agenda Item; Parish of Ascension v Berkley Insurance Company, written demand (Legal Counsel). Berkley Insurance is the parish’s Public Entity provider in return for a $236,450 annual premium. While none of the Council participants is talking, the closed door session was to authorize outside legal counsel ($100,000 more of your tax dollars) to pursue reimbursement of President Kenny Matassa’s legal fees ($235,000) paid to his private criminal defense attorney. Reconvening after its secret session, Chairwoman Teri Casso recognized Councilman Aaron Lawler in a scripted action. “I’d like to make a motion to authorize our legal counsel to take all legal actions necessary to pursue any and all claims, um, arising out of, uh, an insurance (inaudible stammer) about any insurance claims related to the discussion in the executive committee,” Lawler wended his way through an inartfully crafted motion. Councilman John Cagnolatti dutifully seconded and there was no objection. It was not the first time Lawler took the lead for Matassa (keep reading). 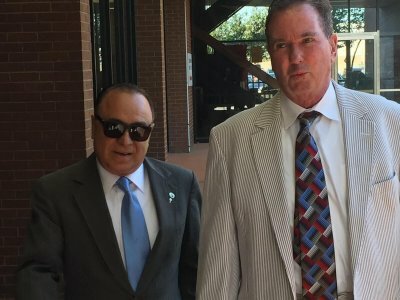 According to a member of his administration Matassa’s attention turned to reimbursement of the fees, incurred to defend a felony bribery charge, as soon as he was acquitted on July 11, 2018. Lobbying various members of the Parish Council to reimburse those fees, appropriation can only be done by ordinance, Matassa never could cobble together the requisite six votes. It would be political suicide to reimburse Matassa’s fees though, we suspect, several of the 11-member body would like to do so. 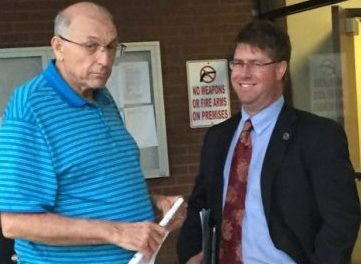 As 2018 drew to a close Matassa’s private lawyer and Parish Legal Counsel O’Neil Parenton began looking for an alternative source of funding. Enter Councilman Aaron Lawler. “I have been thinking about this. Yes, I know this scares y’all. I think there is some information we need before we can go forward with an agenda item. If it does get on the agenda I will make a motion to table the item and I have several people that will second the motion. Below is a short list of questions/items I would like before we have to make a decision on this. 1. Do we have public official liability coverage? If so, what is the deductible and the limits? 2. Was our agent notified to place the public official liability carrier on notice? Who placed the agent on notice? How and when was the agent put on notice? How and when did the agent put the carrier on notice? 3. Who was the adjuster assigned to this claim? 4. If an insurance carrier is denying coverage, have we received a letter of declination? Please produce a copy of the letter. If a letter of declination was received why wasn’t the council notified of this? Who received the letter of declination? 5. If we have received a letter of declination, have we notified the agent’s errors and omissions carrier of a potential claim? 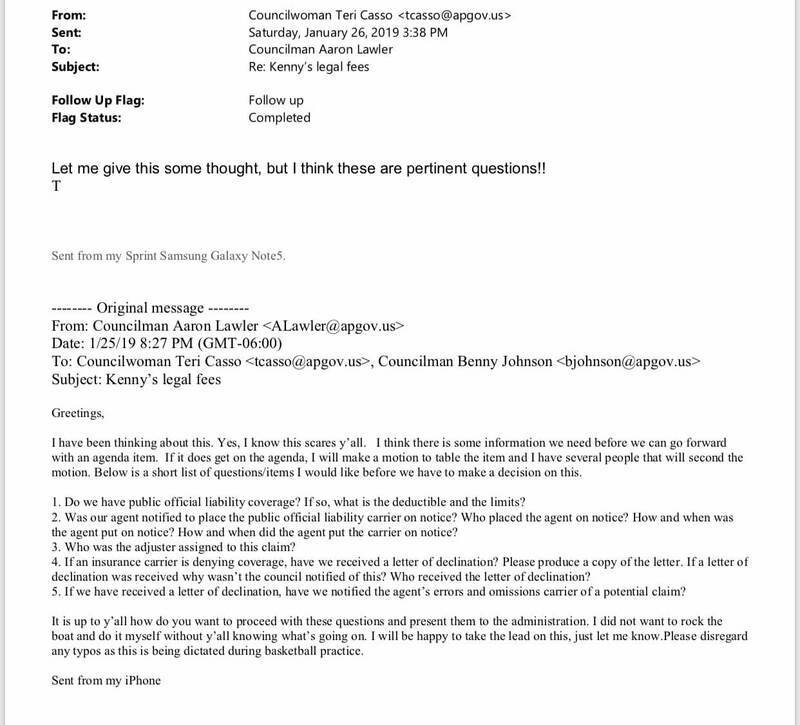 Is the parish contemplating suit against its insurance agent on behalf of Kenny Matassa? “It is up to y’all how do you want to proceed with these questions and present them to the administration. I did not want to rock the boat and do it myself without y’all knowing what was going on. I will be happy to take the lead on this, just let me know. Lawler, an insurance defense lawyer himself, is uniquely suited to pursue Matassa’s interests. “What, specifically is the purpose of ammending (sic) the contract with Roedel Parsons by 100%? Sandra did not elaborate in her email.” (Sandra is Sandra Perera of the Finance Department). “Hi Teri, Please see the email stream below and the attachments. Are you familiar with this contract? Can you answer my question…? Unsurprisingly, Cagnolatti went along. Back in 2017 he caught a lot of flak from power brokers inside the City of Gonzales for a “No Confidence” vote in Matassa. The two served on the City Council together from 2009-12. What meeting Casso was referring to is a mystery. Cagnolatti chairs the Personnel Committee which would meet twice in February. 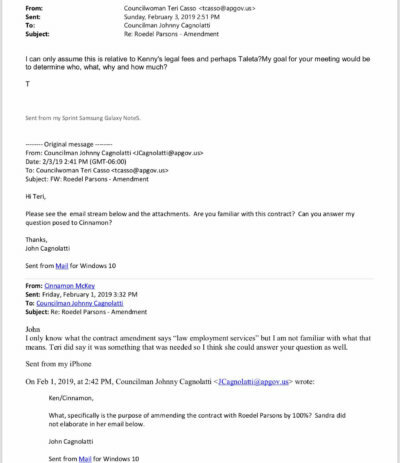 Neither of its agendas included an item related to the email thread. Roedel Parson’s new contract did make it onto Chairman Bill Dawson’s February 12 agenda of Finance, though. Pelican Post emailed a series of questions to each Council member on April 6. None has provided any answers.